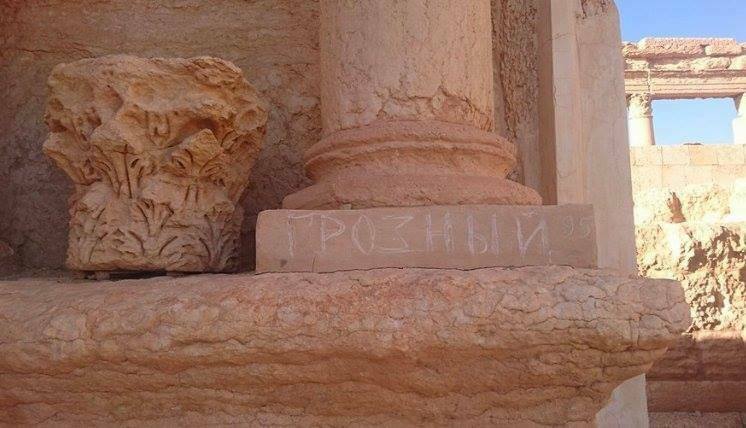 On 1 July, the Palmyra Coordination Facebook Page release a picture of vandalism on what appears to be the base of a column in the city’s archaeological ruins. The page states that a Russian soldier defaced the base by writing “Grozny” in Russian, apparently in reference to the Russian military clampdown on the Chechen uprisings. The post is available here. “Coalition forces besieging Raqqa have punched two small holes in the Rafiqah Wall that surrounds the Old City.” The wall is part of the Tentative World Heritage site. Read more on the Newsweek website here and Fox News here. Tamim Mamoun Mardam Bey has uploaded a number of photos of damage to the Al-Umari mosque, here and here. The Authority of Tourism and Protection of Antiquities in Al-Jazira Canton has documented sites in Al Hasaka area ( TellAvgir Tahtani – Tell Avgir Foqani – Tell Alo – Tell Ma’ak – Tell Mansur ), available here. ASOR’s Cultural Heritage Initiatives May 2017 Monthly Report is now available here. ASOR’s Cultural Heritage Initiatives April 2017 Monthly Report is now available here. Authorities in Palmyra have recovered four funeral busts dating from the second and third centuries, which were reportedly looted by ISIS. Read more on the DGAM website here, and the Syrian Arab News Agency website here. The Authority of Tourism and Protection of Antiquities in Al-Jazira Canton released a statement reporting the discovery of a numerous damaged antiquities ranging from broken pottery, skeletons, stone tools, various other artifacts. According to the authority, the majority of these items were stolen from a German archaeological mission’s home in Tell Mnbq and an American one in Tell Al-Swihat. Read the full article, Stolen Mission House, here. The Syrian Directorate General of Antiquities & Museums announced that they had found a new ground mosaic panel dating back to the 4th century at Wadi Barada in the Damascus Countryside. The mosaic spans roughly 50 sq.m. and is part of an archaeological site that has been subject to various looting over the recent years. Read the full article on the DGAM website, The Discovery of a Mosaic Panel in Wadi Barada, here, and on the Syria Times website here. On June 30th 2017, the Idlib Antiquities Center announced that they had set up a workshop that is to last 5 months, aimed at developing laws for the protection of cultural property and archaeological sites in the governorate of Idlib, in cooperation with the following organisations: Lawyers for Justice, Nasra Al Malzoum Center, the Bar Association, and a representative from the Interim Government. A video has also been released. The post, including photographs, is available here. The Authority for Tourism and Preservation of Antiquities in Al-Jazira Canton has worked with the Kurdish Security Forces (Al-Asayish) to a general statement to all the military institutions which are under its leadership to comply to fully collaboration with the ATPA in safeguarding the archaeological sites in Al Jazira Canton and northern of Syria. Read more here. The Authority for Tourism and Preservation of Antiquities in Al-Jazira Canton hare working to prepare an inventory of sites in their area. As part of this process, they are documenting them. Read more here. The Shubbak festival of contemporary Arab culture includes presentations and performances by Syrians, and events which examine how artists “are responding to the threat to cultural heritage.” (London, 1 – 16 July 2017). Learn more on the Broadway World website here. Read more on the Al-Monitor website here. The 41st Session of the World Heritage Committee is taking place in Kraków, 2 – 12 July 2017. Watch the livestream on YouTube here. The World Heritage Committee focuses on Syria, even promoting a charity concert. “The 41st session of the World Heritage Committee will be accompanied by a charity event for the residents of Aleppo. It is planned to raise funds during the session (2-12 July), as well as a concert on the Wołyński Boulevard (July 9), where Kasia Kowalska, Sebastian Karpiel-Bułecka, Dariusz Malejonek and Halina Mlynkova will perform.” Read more on the 41st Session of the World Heritage Committee website here. A recent UN event, ‘Heritage in Danger’, presented “the results of a UNESCO project dedicated to the safeguard of cultural heritage in Syria.” Their response to protect culture in crises, current challenges, the importance of culture in emergency situations and human rights can be found on the UN Regional Information Center for Western Europe website here. Read more on the Al-Masdar News website here. Learn more on the Facebook event here. Read more on the Northern Echo website here. Read more on the ANSA Med website here. The Middle East Eye tells the story of Samer al-Kadri, a Syrian refugee who has opened Holland’s first Arabic bookstore in order to keep Syrian culture alive even outside of Syria. Read the full article here. In an op-ed for News Deeply, the former British ambassador to Syria examines how the international community can help rebuild Syria and emphasizes the need to involve Syrians in the recovery processes. Read the article on News Deeply here. Syrian musician Kenan Adnawi performs traditional Syrian music at the Montana Folk Festival (USA). Read more on the Missoulian website here. The Financial Times examines the return of Syrians to Aleppo and their quest to reclaim culture and heritage. “The old city, at the heart of Aleppo between its east and west, bound together Syrians from all walks of life. They came to wander, shop or sell, as they had for centuries…” Read more on the FT website here. Crafts supply store Hobby Lobby has been fined $3 million for smuggling ancient artifacts out of Iraq. Although this case deals with Iraqi antiquities, objects from Syria can follow similar paths. Read more on the New York Times website here.